The Sydney Morning Herald, 14 October 1997, p.24. 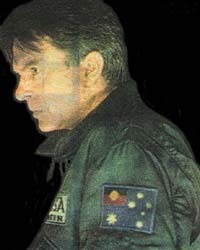 We asked last week if any reader could confirm our impression that in the new sci-fi film Event Horizon , Sam Neill is wearing an arm patch that contains an Aboriginal flag and the Southern Cross. Many readers phoned to say that it looked that way to them, too. Best of all, the film′s distributor, UIP, sent us a photo and an explanation. Apparently the film′s director encouraged the actors to wear the flags of their various countries on their uniforms. Sam Neill had his Australian flag updated to the way he thinks it should look in 2047 (we always knew Sam wasn′t really a kiwi). In a similar spirit, Joely Richardson, who plays a British astronaut, is wearing the flag of United Europe rather than the Union Jack. Monarchists should therefore feel free to stay home.